2000; 370 pages. Genre : Satiric Fantasy. 24th book in the Discworld Series. Awards : #153 in the "Big Read". Overall Rating : C+. The Dwarfs' "Scone of Stone" has been pinched by miscreants unknown. For that matter, a replica of the Scone of Stone has also been pinched. The newly-elected Dwarven King of Uberwald can't be crowned without it. This is a job for Sam Vimes of the Night Watch, although he doesn't think so. So the Patrician deftly appoints him Ambassador to Uberwald, and Sam finds he has to go to there, and has to learn something called "Diplomacy" to boot. It's Discworld; it's Terry Pratchett; it's cool. There's a sharp, talking dog named Gaspode who is probably the brightest bulb in the book. There's a slew of Frankensteinish Igors who prove to be useful servants in all sorts of roles. There are werewolves, and vampires, dwarves and trolls, humans and DEATH. Only the Hobbits and Treebeard are missing. OTOH, there's a lot less zaniness and wordplay here than in the earlier Discworld books. It's certainly darker than Guards! Guards!, and there's a lot of killing going on. The themes of T5E are rather serious : diplomacy, racial prejudice, and interspecies dating. And for the first time for me, there were some irritations. All the Igors speak with a lisp. "Ith thith yourth, mathter?" and all that. Funny the first time; tiresome the thousandth time. Then there are the vampires, who replace W's with V's. "Ve vill vant you to vatch our vishing vells." Here's hoping you are enamored by Sergeant Schultz on Hogan's Heroes. Finally, there are the plot lines themselves, normally a forte of a Discworld book. Sam deduces what happened to the true Scone of Stone, but never really proves it. And the subplots just sort of fizzle out into oblivion. The Night Watch office is plagued by disappearing sugar cubes. By the end of the book, they're down to only one. But if Pratchett ever gave an explanation for this, I didn't catch it. Still, a mediocre effort by Pratchett is better than most fantasy books, and the insight he gives on the three themes listed above will make you sit back and re-evaluate your opinions about them. I think I've read somewhere that the Discworld series gradually evolves from silly spoof to a subtler shade of satire as it goes along, and I guess I'll have to get used to this. We'll give T5E a "C+". but recommend that your first Discworld book be something else, like Guards! Guards! 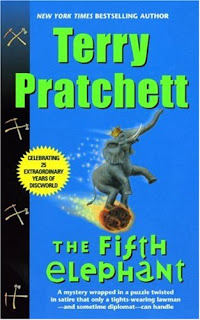 So, when linking up your post, I almost typed in "The Fifth Element" instead of "the Fifth Elephant." heh. tonight when i went to find the bookcover image, i did the same thing. I've never heard anything but raving over Pratchett's books. I guess he can't win them all, right? The fifth element rocks! The cover of this book is veeery interesting..
:) Funny, I also saw it first as "The Fifth Element" and immediately thought of the movie. That movie was out a long time ago. Bruce Willis still had hair then, sort of. I really need to read more books in this series! I have only read a couple and that was years ago! Conversely, I find Igor's voice to be one of the absolute best hooks for getting into the Discworld's particularly English type of humour. The worst part about it is stopping yourself from reading them out loud, especially in the library or on the buth.